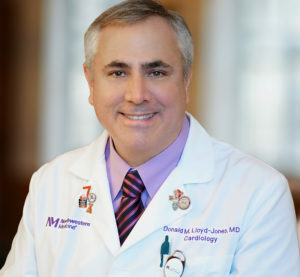 Donald Lloyd-Jones, MD, ScM, senior associate dean for Clinical and Translational Research, chair of Preventive Medicine, director of the Northwestern University Clinical and Translational Sciences Institute (NUCATS) and the Eileen M. Foell Professor, was the senior author of the study published in JAMA. Adults who develop high blood pressure before the age of 40 are at a significantly higher risk for heart disease, stroke and other cardiovascular events later in life, compared to those who maintain normal levels, according to a new Northwestern Medicine study. The study, published in JAMA, is the first to assess cardiovascular risk using new 2017 guidelines from the American Heart Association and American College of Cardiology that lowered the clinical definition for elevated blood pressure and hypertension. “We wanted to apply the new classification to a population of young people to see whether those definitions do in fact identify people who are at a higher risk for cardiovascular events and all-cause mortality,” explained senior author Donald Lloyd-Jones, MD, ScM, senior associate dean for Clinical and Translational Research and chair of Preventive Medicine. Yuichiro Yano, MD, PhD, a former postdoctoral fellow in Preventive Medicine and now an assistant professor at Duke University, was the first author. In the study, the investigators analyzed data from 4,851 young adults included in the Coronary Artery Risk Development in Young Adults (CARDIA) study. Each participant was categorized as either having normal blood pressure, elevated blood pressure (a systolic blood pressure of 120 to 129 mm Hg), stage 1 hypertension (130-139 mm Hg) or stage 2 hypertension (140 mm Hg or higher). They discovered that participants who developed elevated blood pressure, stage 1 or stage 2 hypertension before age 40 had a significantly higher risk for serious cardiovascular disease events — including fatal and non-fatal heart disease, heart failure or stroke — as they aged, compared to those who maintained normal blood pressure. Even young adults with only elevated blood pressure had a 67 percent increased risk in cardiovascular events over the study’s median follow-up of 19 years. Among young adults with clinical hypertension, investigators found a two- to three-fold increased risk for cardiovascular events. The findings suggest that the new blood pressure guidelines may indeed help identify young adults at higher risk for cardiovascular events, who may benefit from lifestyle modifications, or in more serious cases of hypertension, drug therapy. “It also reinforces the very important message to not let your blood pressure go up in the first place. It’s much harder to put the horse back in the barn once it’s out,” said Lloyd-Jones, also director of the Northwestern University Clinical and Translational Sciences Institute (NUCATS) and the Eileen M. Foell Professor. Lloyd-Jones noted that elevated blood pressure is not inevitable with aging. “People who maintain a healthy lifestyle — including keeping their weight lean, participating in physical activity and eating a healthy diet that’s low in sodium — don’t see that elevation in blood pressure over time and therefore could avoid this risk,” he said. Other Northwestern co-authors of the study include Philip Greenland, MD, the Harry W. Dingman Professor of Cardiology, director of the Center for Population Health Sciences and a professor of Preventive Medicine in the Division of Epidemiology; Norrina Allen, PhD, MPH, associate professor of Preventive Medicine in the Division of Epidemiology; and Laura Colangelo, a biostatistician in the Department of Preventive Medicine. The Coronary Artery Risk Development in Young Adults study (CARDIA) was conducted and supported by grants HHSN268201300025C and HHSN268201300026C from NHLBI in collaboration with the University of Alabama at Birmingham, HHSN268201300027C from Northwestern University, HHSN268201300028C from the University of Minnesota, HHSN268201300029C from the Kaiser Foundation Research Institute, HHSN268200900041C from Johns Hopkins University School of Medicine, P20GM104357 from the National Institute of General Medical Sciences of the NIH, 15SFRN2390002 from the American Heart Association, K24-HL125704 from NHLBI, and by the Intramural Research Program of the National Institute on Aging (NIA) and an intra-agency agreement between NIA and NHLBI (AG0005).